Absolutely lovely boho chic look! The print on your kimono is so pretty and fun for spring! And I just can’t get enough of your fringe purse. I LOVE that kimono! I’m so excited for spring and florals! Love the kimono with the flares- I will have to try that combo this spring when the kimono is brought down into rotation! These jeans are amazing on you, and I love the floral kimono! How chic do you look lady!?? I am obsessing over these flares and this look! So fun! Love our matching fringe today, Shauna! And what a fabulous floral kimono. Such gorgeous pictures too. Have a wonderful start to the week! I love this look! Those kimono is so fun and even better with the flairs! Prettiest Flower Child I’ve ever seen!! What an amazing kimono!! And major Flare love!! Hope your Monday is marvelous!! That bag!!! Seriously, this is the perfect boho outfit. Love, love love! So groovy! Love the flares. So lovely,definitely one of your best signature looks. Kimonos are definitely a favorite for me. Florals and fringe! Love it! I LOVE this look, Shauna! You are the queen of flares and boho perfection. I love the cardigan, those sunnies and that lip color on you, so pretty! Thanks so much for sharing, beauty, and I hope you’re having a great start to your Monday so far! How fun is this look! Love those flares and your florals! So perfectly styled! Love your boho looks, this kimono is gorgeous!! I am in love with these glasses! Super cute! I love that you’ve embraced the style and you pull it off so well! The fringe bag is adorable. Ha! cute post! You do boho chic so well keep on keepin on!! You seriously rock the boho look!! Looking fab as always! Obsessed with these over exaggerated flares! So cute with the kimono! that kimono is STUNNING!!! seriously, what a gorgeous piece!! You’re looking lovely as always. love the reto vibe of this outfit, the kimono is so cute! You look so cute and chic! I love that beautiful kimono! PERFECT! So Rachel Zoe and I love it head to toe! Yes you just made me rhyme! 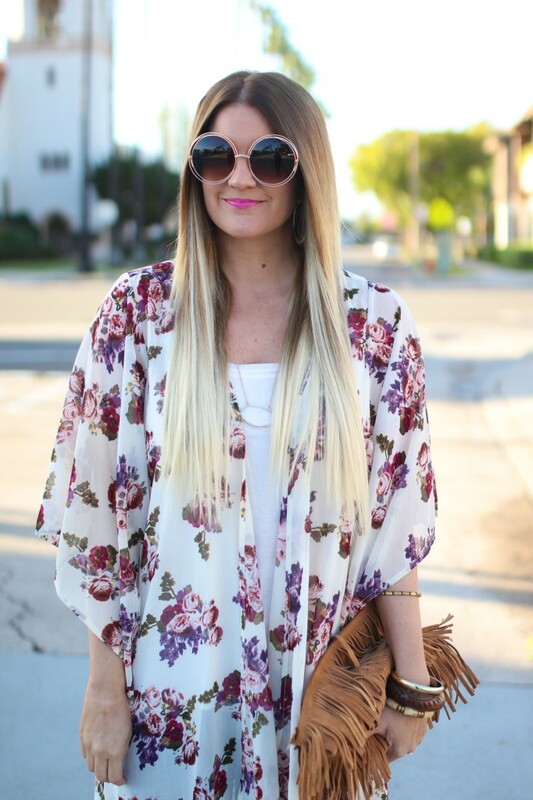 Oh yes, need this floral kimono! The length is perfect too, would be great as a coverup! You look amazing! I would not be able to pull off this look but you look great! Boho beauty! I love your kimono, and those sunnies are perfect! Looking gorgeous! Love this entire look doll. STUNNING! Happy Tuesday! Love these boho vibes!!! You look gorgeous girl!!! Loving your boho chic look. You look great lady! YES beautiful. Talk about kimono envy! Flower power – I love this, Shauna! You are super gorgeous in this look! My fave indeed! Love this look. The flares are so old school! I am really enjoying checking out your blog! Love this 70s Vibe!!! So gorgeous!! I am obsessed with how boho fab this is, lady! The floral kimono looks great. This is head to toe perfection dear! You absolutely nailed that boho chic look!! Amazing amazing amazing!! This is the most Boho look I have seen on you. You are rocking the over-sized bell bottoms, the kimono and that fantastic fringe clutch! You rock the boho look! I adore those flares! Absolutely love this look – those sunnies are gorgggggg! What a cute boho look, Shauna! I love the color palette. Your floral kimono is beautiful! You rock this boho look! 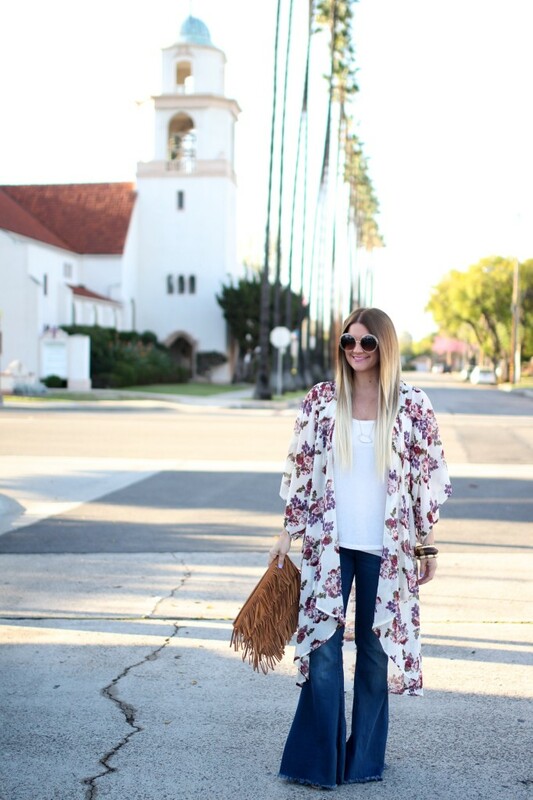 The kimono the perfect jeans….love it all. Love this retro outfit <3 Very stylish & comfortable! Looking cute hon love the floral print kimono. love the boho look! Keep it coming girl! in looove with your flared jeans! love the fray hems and it goes perfectly with your kimono! Love the kimono with the fringe! Very hippie chic! Love it! Loving the boho look! That’s such a pretty kimono!